Adam qualified from University College Dublin in 2009. Since then Adam has worked in Ireland, the United Arab Emirates and the UK. 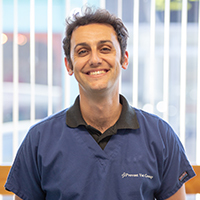 He enjoys the variety that general practice has to offer and also enjoys getting to know the pets and their owners. In 2015, Adam decided to further his studies and obtained a postgraduate certificate in small animal medicine from Harper Adams University. Adam and his wife Kelly, a veterinary nurse, both joined Provost Vets in 2017. Along with their son Aaron, Adam and Kelly take pleasure in exploring all that Fife has to offer with its beautiful coastal walks and good food! They have a little feline companion called Jenson, who Adam rescued while working in down in working down in Buckinghamshire.